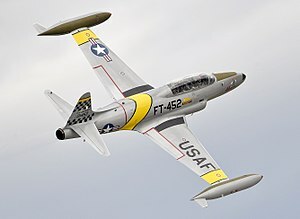 The Lockheed T-33 Shooting Star is a US military jet aircraft. It was used as a training aircraft. It was designed and built by adding a second seat to the P-80 Shooting Star. It was used by many countries in the world and built under licence in Canada and Japan. The last one retired in 2017. More than a hundred are on display in museums around the world. This page was last changed on 2 September 2018, at 01:41.